Challenges: One of our clients wanted to improve the response time from HR team as delayed response from HR team can potentially lead to employee dissatisfaction and valuable members choosing to move on from any organization. Our experts suggested a mobile based solution to enable employees get quick answers to certain standard questions. 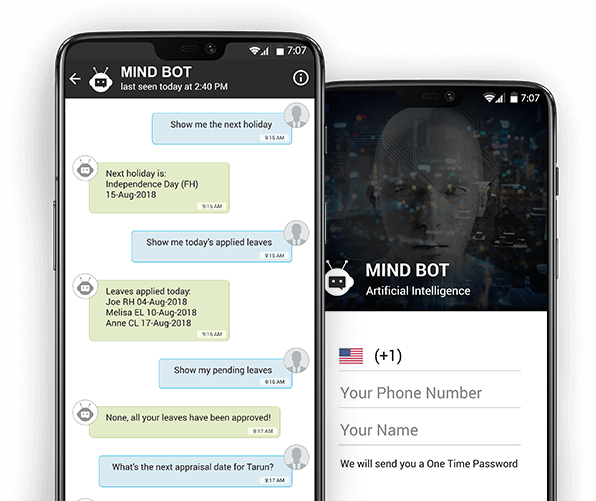 Solution: We developed an Artificial Intelligence based chatbot that was made available to all employees for quickly getting answers and accessing relevant information. This enhanced the employee engagement and in turn their satisfaction with the company’s facilities provided. The chatbot makes use of Dialogflow API V2 which primarily acts as the bot engine using algorithms for natural language processing to get the intent from the user’s input. After getting an intent from Dialogflow, the bot queries multiple back-end systems, processes the information and presents it to the user almost in an instant. Digitally transform user engagement via our Artificial Intelligence powered solution. Contact us for custom artificial intelligence programming and AI consulting.